Vidgle - Tag Archive for "Anthony Zaragoza"
Home Posts tagged "Anthony Zaragoza"
Did you know Vidgle hosted the costume contest at JayCon? Of course you did! 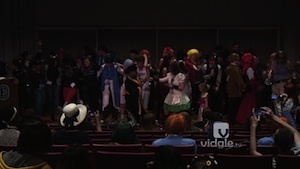 Watch the costume contest from JayCon 4 2013 in its entirely. From getting to know the cosplayers to the singing and dancing, the costume contest is the event that a JayCon attendee cannot miss! As the second day of Setsucon comes to a close, Anthony and Fred talked about what went on at the sixth Setsucon in State College, PA.
As our new tradition, Anthony, once again, interviews with the judges and the emcee from the cosplay masquerade at Setsucon 2012. It’s the second and final day of Setsucon, 2012 in State College, PA. Anthony and Fred will see what attendees had to say about the sixth Setsucon. Anthony and Fred are back at the sixth Setsucon in State College, PA! They are going to explore to see what attendees had to say about the big day at Setsucon 2012! It’s time for Anthony to sum up his experience at Another Anime Convention 2011 in Nashua, NH. It’s time for game 2 for Con Goer’s Con Trivia at Another Anime Convention. It’s the big day, Saturday, at Another Anime Convention. Anthony will talk to the cosplayers and attendees to see what they had to say about the sixth annual Another Anime Convention.